LOS ANGELES -- Only the stringy, white-blond hair is a giveaway that the wiry man next to me is Tom Petty. Smaller and frailer than the larger-than-life figure he inevitably cuts when he performs on stage, the lean rock star dressed in a red-plaid flannel shirt, black pants and sunglasses mills inconspicuously around Lookout Management offices. He lopes from room to room like one of the management staff, bumming cigarettes, making conversation. There are no yes-men scurrying to fill his every need. And there's little of the conceit that often oozes from a musician who boasts a five-year history of successful albums; a musician who recently shared the Top 10 company of Tina Turner, Madonna and Bruce Springsteen when his 1985 LP "Southern Accents" rose as high as No. 7 on the charts. "I'm a person who never wanted a lot of attention," he acknowledges later in our interview. "Not attention in that way." Attention, he means, in the way that fame brings. Petty has mixed feelings about the sheltered existence that comes with rock stardom. "It's a double-edged sword," he says, one eyebrow arching over his glasses. "You are pampered on one hand. But the other side of the blade is just as sharp. "You're batted about by different forces by most people -- like isolation. And getting confused about who you are. Especially if the people around you tend to swing with the more popular idea of who you are. Then, you can never tell where fantasy ends and reality begins. "There are huge negative sides to fame. You can't live in society like everyone else. And anytime when you give up the way you live, when you realize that now you have to adapt to a different existence, that's enough to shake up your psyche for a long time. It took me years to come to grips with that, or even settle down with the idea." 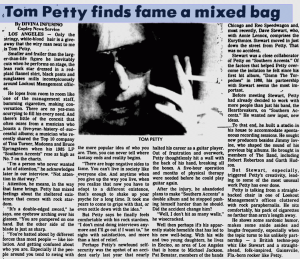 But Petty says he finally feels comfortable with his rock stardom. "I don't make doing interviews anymore and I'll go out if I want to," he sighs with satisfaction, and more than a hint of relief. Perhaps Petty's newfound self-security was the upshot of an accident early last year that nearly halted his career as a guitar played. Out of frustration and overwork, Petty thoughtlessly hit a wall with the back of his hand, breaking all the bones. A five-hour operation and months of physical therapy were needed before he could play guitar again. After the injury, he abandoned plans to make "Southern Accents" a double album and he stopped pushing himself harder than he should. Did the accident change him? "Well, I don't hit as many walls," he wisecracked. Well then perhaps it's his apparently stable homelife that has led to his new well-being. With his wife and two young daughters, he lives in Encino, an area of Los Angeles that his home to Michael Jackson, Pat Benatar, members of the bands Chicago and Reo Speedwagon and, most recently, Dave Stewart, who, with Annie Lennox, comprises the Eurythmics. Stewart moved in just down the street from Petty. That was no accident. Stewart was a close collaborator of Petty on "Southern Accents." Of the factors that helped Petty overcome the isolation he felt since his first hit album, "Damn the Torpedoes" in 1980, his partnership with Stewart seems the most important. Before meeting Stewart, Petty had already decided to work with more people than just his band, the Heartbreakers, on "Southern Accents." He wanted new input, new ideas. To that end, he built a studio in his house to accommodate spontaneous recording sessions. He sought new producers besides Jimmy Iovine, who shaped the sound of his previous big albums. He brought in members of The Band, including Robert Robertson and Garth Hudson. But Stewart, especially, triggered Petty's creativity, leading to some of the most unusual work Petty has ever done. Petty is talking from a straight-backed chair in one of Lookout Management's offices cluttered with rock paraphernalia. He sits comfortably, his pack of cigarettes no farther than an arm's length away. He shows some sardonic humor, makes some snide asides and laughs frequently, especially when the the topic turns to his unlikely partnership -- a British techno-pop whiz like Stewart and a straight-ahead, folk-inspired, Gainesville, Fla.-born rocker like Petty.